Another spring nature trip in Oregon. The calendar actually says it’s solstice. 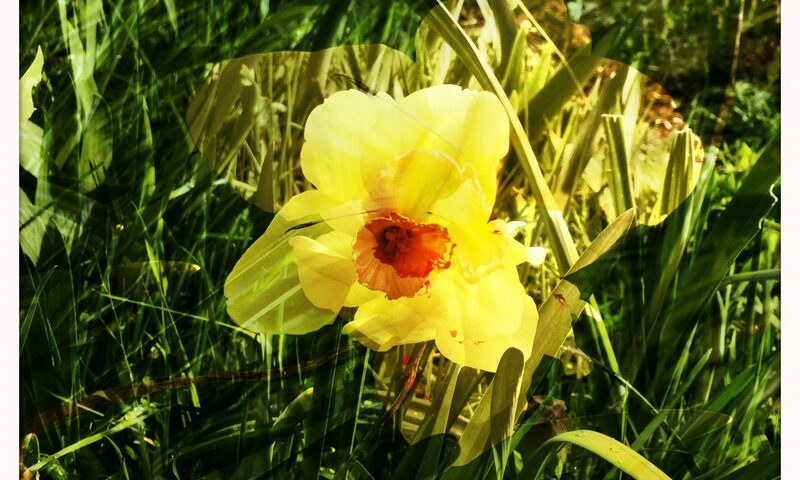 So Happy Solstice and Happy Summer. Truthfully, the weather still says April. And this last weekend we took a wonderful trip that took us down the Columbia gorge on the oregon side and into central Washington. 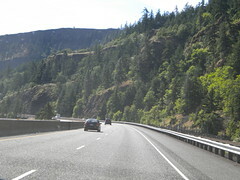 The variation in topography and vegetation are striking going down the Gorge. 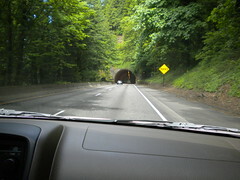 Starting out going east from Portland to about forty miles in, the vegetation was lush and more like a temperate rain forest. But when we began to go behind the rain shadow, it became more and more arid. First the grasses browned up, then thinned out. 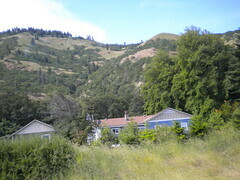 Then the conifers gave way to deciduous trees and scrub oak, and then the trees stopped altogether. 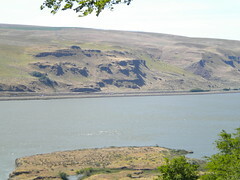 The basalt cliffs and old lava flows revealed a once volcanic area. The vulcanism is still alive and well, as is evidenced by nearby Mt. St. Helens, Mt. Hood, and Mt. Adams. Around Hood River we stopped to spend the night at a bed and breakfast. This is a wonderful Victorian home with a large garden and lots of flowers on a beautiful rambling Rose which I think was blah with Adirondack chairs amidst some daylilies. The town was very cute on very touristy on and we did have a wonderful dinner at a restaurant where we were able to look from their patio and see wind surfers on the Columbia River. In the morning we took a walk around the neighborhood and saw lots of wonderful homes with beautiful gardens and all kinds of flowers. After breakfast, we drove on. 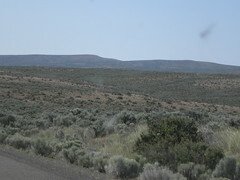 By the time we actually crossed the Columbia River into Washington State it was outright desert. There we climbed out of the gorge and went to a wonderful art museum in the middle of nowhere. Interestingly, they had a wonderful Rodin collection and possessions that had belonged to the queen of Romania. 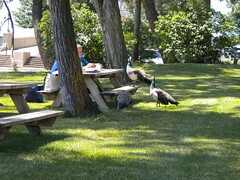 Peacocks roamed the grounds and were outright mooches, working the picnic tables. 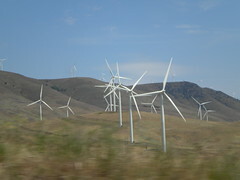 In the background were many wind turbines, a testament to how windy the gorge can be. In another direction, was a spectacular view of Mt. Hood. 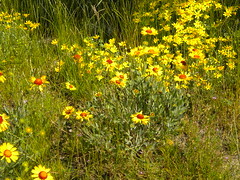 Going through central Washington toward Ellensburg, we came across rolling hills, interspersed with basalt cliffs and outcrops that were covered with sagebrush and wildflowers…lupine, coreopsis, yarrow and, I think, a blue salvia. A not so welcome addition, was scotch broom, which is a noxious weed in both Washington and Oregon. Our destination was a fun visit in Ellensburg with some friends. Interestingly, some flowers in their area were blooming ahead of ours, like the hostas, while others were behind us, like the lilacs. Interesting. I could not resist adding another clematis to my collection when I visited a nursery. So many plants, so little time. In all, it was a very nice trip, although it was pretty long. The 5 hour drive tired us out. Going we stopped at Hood River to stay at a bed and breakfast. However, going back we drove all the way through. 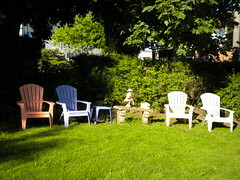 When we got home, all we wanted to do was sit and relax, which we did. Of course, we now had lots of ideas to incorporate into our own home garden.